Continuing the series of recipes that I started earlier this year when cooking tasty and nutritious food for my daughter after child birth, this is an easy and tasty Dal or lentil stew. 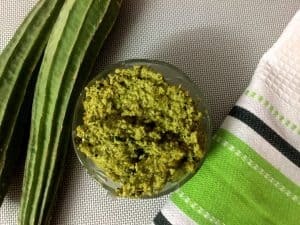 As I have said in the post on Cooking for the New Mom on this blog, Tur dal (Towaram paruppu in Tamil) or pigeon pea lentils are to be avoided during the post partum period as they can be difficult to digest as well as can be gassy for the baby. 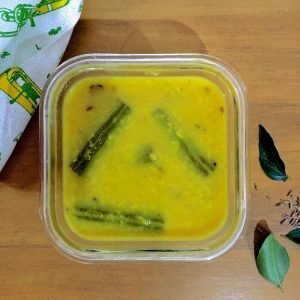 This nourishing Masoor Dal for the New Mom, on the other hand is one of the best foods you can give the nursing mother. Masoor dal is easy to digest and is said to stimulate/ improve lactation, and is rich in iron and protein. 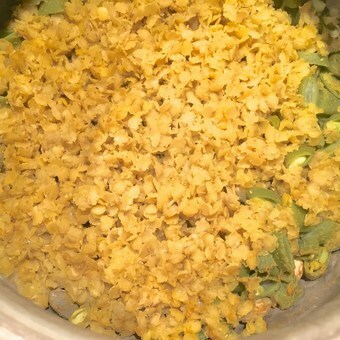 This dal is cooked in Ghee (clarified butter) and may be substituted by olive oil or a light vegetable oil. Ghee is most suitable both in terms of health and nutrition and flavour. Fresh vegetables that are easy to cook and digest are added to the dal. 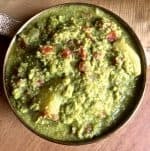 In this recipe for a nourishing Masoor Dal for the new mom I have included broad beans (flat beans or avarekai or surti papdi), french beans and tomato. No chillies or onion are included as these are to be avoided in the weeks immediately after delivery. As a variation, you may add any of the vegetables suitable for the new mother – those belonging to the squash or gourd families are the best, as they cook easily. 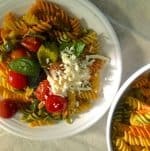 Spinach or fenugreek methi leaves are another option. Ripe red Tomato may be added to the other vegetable, from 10 days after delivery. 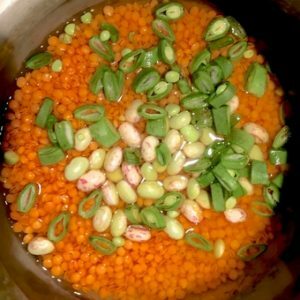 For this post on making a nourishing Masoor Dal for the new mom, I had these pretty cranberry beans from the Farmers market, and I shelled and added them to the dal when cooking. 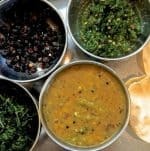 If cooking for a normal diet, the same recipe may be followed, with the addition of green chilli and onions when grinding the masala for the dal and a dash of lemon juice just before serving. For the post partum diet, I did not add onions or lemon juice. 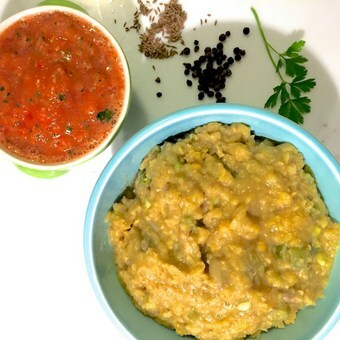 When any new ingredient (such as a type of dal or vegetable) is introduced in the food for the new mother, it is best to try it for lunch rather than dinner, and to check upto the next day for any negative effect such as the baby having more gas than usual or either the mom or the baby having an upset stomach). 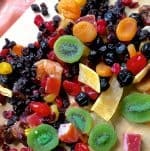 If there is not such effect, the ingredient may be continued to be used every few days. Moderation in everything is the key to a safe diet for the new mom, so plan the meals by rotating the vegetables and lentils. 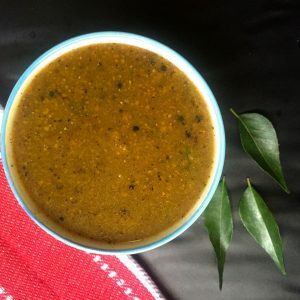 In the pathiya samayal or balanced diet for the first 40 days after child birth, I introduced masoor dal after 10 days form delivery, and used it in either rasam, dal or kootu (the South Indian vegetable stew) every 3 days or so. The split moong dal was the staple on most days. See my post on Cooking for the New Mom, on what to eat and what to avoid during the period after delivery. Nutritional Benefits of Masoor Dal (Skinless split Red Lentils). 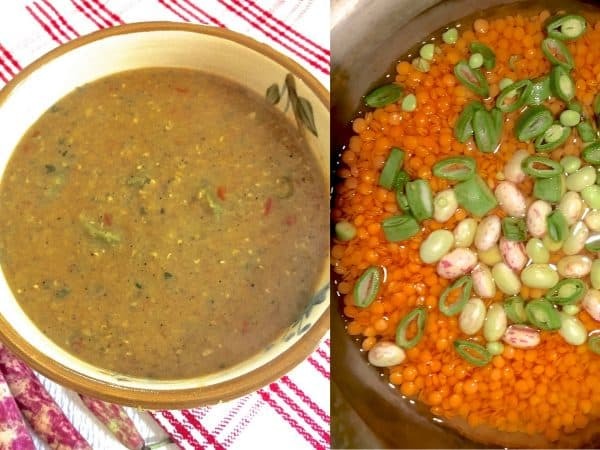 The pink or orange lentils used in the nourishing Masoor Dal for the New Mom, are a powerhouse of nutrition and are popular in Aurveda based food. Packed with protein, they are also rich in minerals such as potassium, phosphorus, sodium, calcium and sulphur. The cooked split masoor dal is easily digested and said to help in intestinal ailments as well as in lowering bad cholesterol. High in antioxidant content, the dal is also said to reduce the risk of breast cancer. A nourishing Masoor Dal for the New Mom. Nutritious and high in protein, easy to digest and considered to facilitate lactation. Easy to make and tasty. Wash the masoor dal and place in the pressure cooker. Add shelled broad beans. Slice green beans thinly and add. I used cranberry beans, but fresh broad beans such as avarekai will be good. Add haldi (turmeric powder) and 2 cups of water. Pressure cook for one whistle (the dal cooks quickly) and then remove from the stove. Allow the cooker to cool on its own while you prepare the rest of the ingredients. Heat a pan and add the ghee. Ghee is good after delivery as it helps heal the tissues. 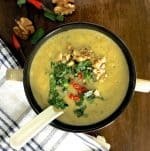 Alternatively use olive oil or a mild vegetable oil that will not overpower the flavours of the dal. When the ghee has melted, add the ground tomato garlic coriander leaves mixture. Sauté on low flame for 3- 5 minutes till the oil shows at the sides of the mixture. Keep stirring during sautéing so that it does not catch at the bottom of the pan. Mash the cooked dal lightly with a whisk or spatula and add to the pan. Add the pepper and cumin powders Stir well and add salt to taste. I always add just a little salt, and then taste the dish at the end when the cooking is almost done, adding more if required. Bring the dal to a boil on high heat and then simmer on low heat till it begins to boil. Keep stirring as the dal can catch at the bottom of the pan and char. Once the dal begins to bubble up (about 6-7 minutes), add warm water (maximum one cup) if you want it thinner. The dal will thicken as it cools after cooking. Check for salt and pepper and a more if required. This is a soft and mild dal and too much of pepper or salt would overpower the taste. As the dal boils, it will start spluttering and may splash out of the pan, so be careful when stirring or checking it out. Stir and remove the from the stove. Garnish with minced coriander leaves and serve it when hot with rice or roti.